“Still taken from “Popeye The Sailor Man-Episode No.016 (The Dance Contest) (1934)” found on YouTube, 19th January 2017. Men can dance with each other – as long as long they fight! I am researching a paper about historical cartoons of men dancing tango with each other. Why is it [supposed to be] funny? What is being attacked? Here, Popeye dances an “Apache Dance” (related to the tango) with Bluto. 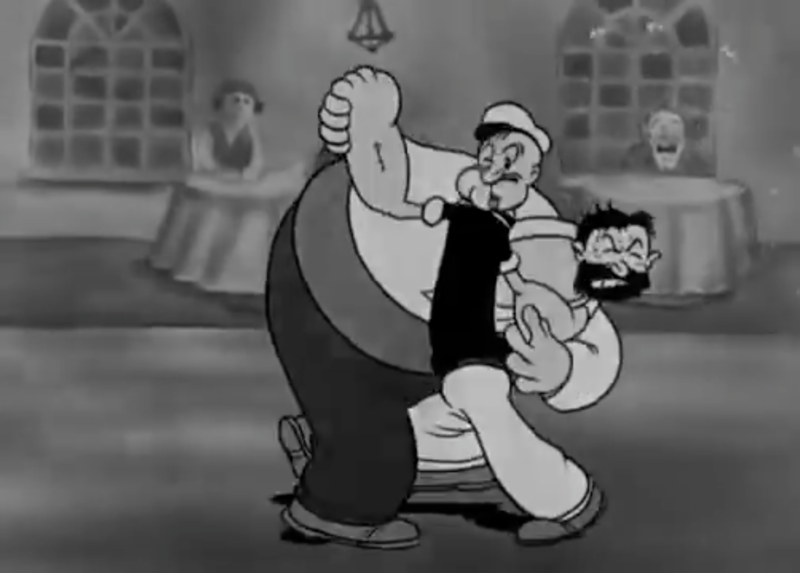 Bluto has just executed a particularly violent dance throwing Olive Oyl around and so enraging Popeye. They fight – Popeye suitably pumped up on spinach – as if dancing tango. Premise: men do not, should not dance together – so that’s why it’s “funny”. Popeye is actually fighting for Olive Oyl’s [heterosexual] affection and Bluto is so groggy from Popeye’s punches he has no choice. In both cases, virility is preserved! Dance competitions were notoriously tough as shown in Sydney Pollack’s 1969 film “They Shoot Horses, Don’t They?”. One Response to "Popeye (almost) Tangos with Bluto, 1934 [still taken from cartoon]"